"A subtle blend of neat melodies, subtle arrangements and folk scents, "Clocks That Tick" honestly fulfils the contract: to make us have a (very) good time listening to it. What more could you ask for?" In the world of neo-progressive, the name Hew Montgomery will refer the most learned to the sources of the movement and more particularly to the Scottish group Abel Ganz, of which he was one of the founders in the early 1980s. Having left the band in 2007 after some musical disagreements, the keyboard player founded his new group Grand Tour, now completed by members of other Scottish bands from this scene, Comedy of Errors and Long Earth. 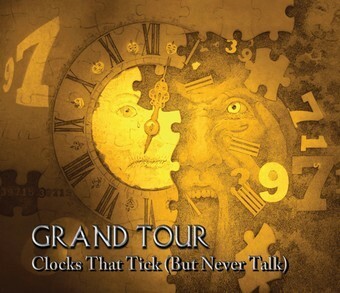 After a first album that went unnoticed, Grand Tour is releasing "Clocks That Tick (But Never Talk)" in 2019. With such a background, you don't have to look very far for the musical style developed throughout the 68 minutes of the album. We are indeed immersing ourselves in the neo-progressive of the 90s, with long, very melodic tracks, served by a simple but clear production, allowing a good harmony between the different instruments. From the very first moments of the title track that opens the ball, the familiar Comedy of Errors will find their marks, rocked by the different melodic themes that follow one another and overlap, notably through a very melodic bass. Without being exceptional, the field fits rather well with the ambiences which also present some aspects drawing towards folk. And as it is always difficult to deny one's past,'Back in the Zone' brings us back into the world of Abel Ganz's first version, with a title that echoes the best-of covering the band's first period ('Back From the Zone'). A little touch of originality, the instrumental "The Panic" will offer us its jumping and striking rhythmic to rehearse its two themes over which multiple layers of sound will be superimposed in a rather successful joyful effect. Throughout the various tracks, a few guitar or keyboard solos fill the space between the sung parts, which are the majority in most of the tracks. However, it is never a question of instrumentalists pulling the cover for themselves, but just to prolong for a few more moments a very pleasant listening, even if it means sometimes pulling a little too long. But in view of the pleasure of letting oneself be carried away by a real talent of melodist, one cannot hold it against him at the time of the final assessment. To enter the world of Grand Tour is to let yourself be carried back about thirty years, to the sources of a typically Scottish neo-progressive, carried not only by Abel Ganz and Comedy of Errors, but also a little later by Red Jasper. A subtle blend of neat melodies, subtle arrangements and folk scents, "Clocks That Tick" honestly fulfils the contract: to make us have a (very) good time listening to it. What more could you ask for? A subtle blend of neat melodies, subtle arrangements and folk scents, "Clocks That Tick" honestly fulfils the contract: to make us have a (very) good time listening to it. What more could you ask for?